The South Dakota State Historical Society recently processed a collection of World War I-era photographs and letters written by Webster, S.D., native Pvt. Herbert McKennett. The correspondence of more than 30 letters dates mainly from 1916 and 1917. McKennett was born July 25, 1894, to Thomas and Dora McKennett of Webster. He attended public school in Webster and later moved to Canada to take a homestead. The donation, from family members, includes the telegram sent to Dora McKennett informing her of her son’s death. Pvt. 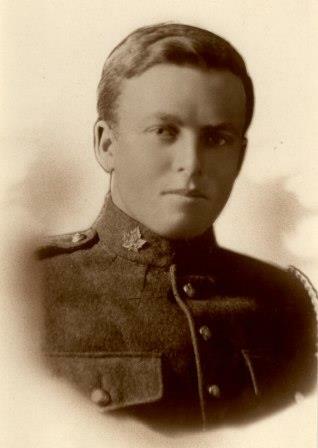 McKennett was killed Aug. 21, 1917, and was buried in the Loos British Cemetery in France. Included are photographs of McKennett’s tombstone in the Loos Cemetery. The donation also features transcripts of McKennett’s letters. The digital transcription files were saved and preserved through the South Dakota State Historical Society-Archives Digital Preservation program. American Legion Post #40 in Webster was named after Herbert McKennett. He was the first Day County resident killed in World War I. To donate historical items related to South Dakota history, please contact the South Dakota State Archives by phone at 605-773-3804 or email at archref@state.sd.us.